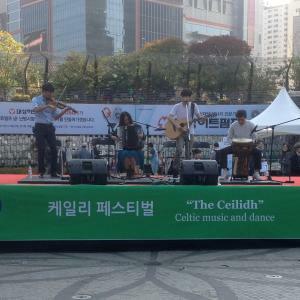 here are the first two sets from the irish association of korea (iak) 2014 ceili, held at d-cube city, sindorim, seoul yesterday. it was a great day, with good music, dancing and fun. d-cube city is a great venue for this, being a small amphitheatre & plaza of just the right size, and the adjacent d-cube mall is handy for getting a bite of food or something to drink (or some shopping, who knows?). for the first time, the st. andrew’s society participated which added both more people and another dimension. i’ll be posting about the event later on my a gentleman who lunches blog, so this here is just about the music. although i’ve billed bard first, above, the ceili started off with ceoltoiri soul, including shauna browne, the iak chieftainess (see? that scottish influence is already taking its toll!). i think they played again later, but sadly i missed that — ceoltoiri soul were great! after some irish dancing, bard came on and played a fantastic set. they finished with a big dance number which was just as well as the scots were on next with a bit of dancing and then everyone was already warmed up for to join the scots for a go at ‘strip the willow’. anyway, a great day! 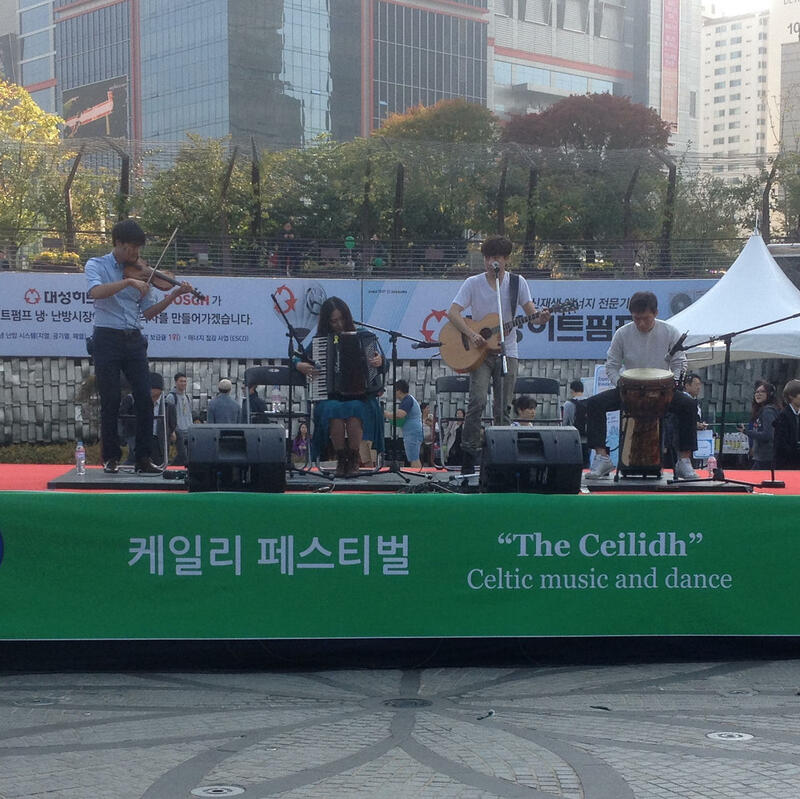 if you’re in seoul in mid-october ever, look up the iak and don’t miss the ceili! Also… .. . thanks for any help on names and/or song titles! – we had to leave before the end, so there may have been another set, whether by bard, ceoltoiri soul or someone else. – this was recorded at a ceili, so there is quite a bit of crowd noise throughout (particularly on a few tracks) a bit of crowd noise on some songs. despite that, i think that the recording came out very well. – there are a few glitches: (a) bad hums in a few spots (especially on the very last track). that was from the sound system, not the zoom h4n. they were really loud, so i dumped the volume on those in audacity, to avoid blasting your eardrums. (b) low recording levels were a problem. playing it back, i had foobar2000, my laptop’s volume and my tv/monitor all turned up all the way… so i used audacity to amplify by +7.0db. the volume is still low, but better. however, (c) that caused a bit of clipping. not much, and only in a couple of very short spots. this was the first recording with the zoom that i have felt pleased with. still, there is the inevitable background chatter especially the boxty rebellion set. anyway, i’ve broken the longer gaps between songs out into separate tracks so they can be easily deleted (which i’ll be doing if i burn this to a cd for anyone). my daughter fionnuala minded the zoom during the boxty rebellion set, but then we had to leave before the 2nd sets by bard and by boxty rebellion, so it’s not the entire peformance. i did not record any of the dancing between bard and boxty rebellion, as it was just pre-recorded music. “seoul irish music bard” will give plenty of hits! this was one of the shows put on in brussels for the irish presidency of the e.u. it was a great show. i normally listen more to jazz, but enjoyed the show immensely. i missed recording the first half of the concert, and the levels were way off when i did get it working (those bagpipes were a bit of a shock). i split tracks where i adjusted the levels, so track 1 is at much higher levels than the rest (and has pretty bad clipping). so…it’s a bit of a train wreck. that said, the sound is pretty good for the rest of the show, and i hope to do better next time.